Learn about the various open source software programs that are 100% FREE, Safe & Amazing! All of which are versatile, familiar, & compatible with the paid versions. This list below contains just a few of the Best options on the internet. There are plenty more across the web by some amazing developers—all Free and Most are Superior to any software you can buy! All of the programs listed in this article are compatible with Windows (all versions), Linux, and Mac OS. Whether you are a student, a small business owner, a person who works from home, or a writer, one thing is clear; you need the proper software to do your job successfully. However, if you don't have the significant chunk of change it costs to purchase all of the software you need, you could end up finding yourself in somewhat of a catch-22. No worries, I'm here to help. If there is one thing I love, it's saving money. Thanks to the many developers and geniuses out there in cyberspace that believe good tools and information should be accessible to anyone; I can write this article to share with you these precious jewels. Here you will find simple, free solutions for all of your basic office needs. Keeping you up to date, efficient, and saving hundreds of dollars in the process. Office Suite software is a must. Since most organizations use Microsoft Office, you need to be sure that you are using programs that are compatible with the Microsoft model. Put simply, if I write something using my free "word" software, I want to make sure that whomever I am sending the document too can open the file seamlessly. So seamless that they won't even know that I'm not using Microsoft. 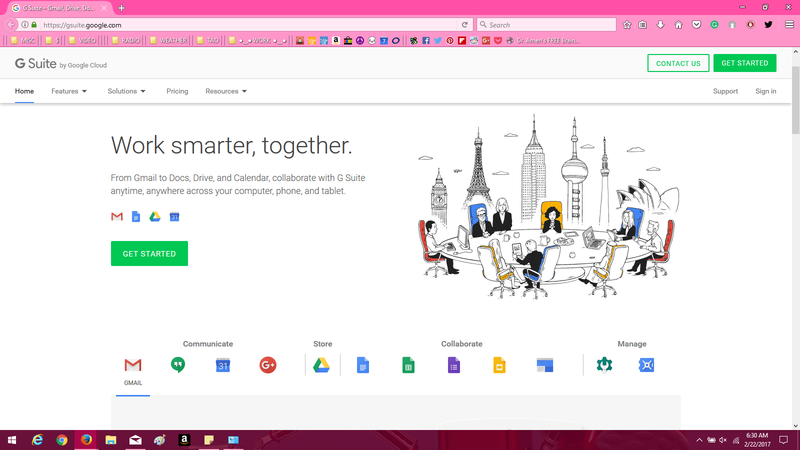 Google's G Suite is an amazing free online option for an all-in-one office suite. The most useful feature is if you are in a situation where you need to share folders and files in real-time with other workers in a different location than your current location (in other words, remotely). The entire suite runs in beta, meaning you never have to worry about "saving" your work; your work is automatically saved as you edit. Everything saves automatically to Google Drive which is located on Google Cloud; saving you space from having to save it to your computer. If you need a doc on your PC, phone, or tablet, no problem, simply go to file and "download as," and you can save it to your device as whatever file type you need. As you can see, Google has it going on, and they are always working to improve their resources. Google is a fantastic all-in-one solution for anyone needing to work from home or on the go. They make it incredibly easy to work seamlessly across all of your devices (including your phone)! Remember, if you work with others that use Microsoft programs, no problem! You can select from an extensive list of file types that you can save your documents as; this includes saving files that open in MS Excel, MS Word, MS Powerpoint, etc. 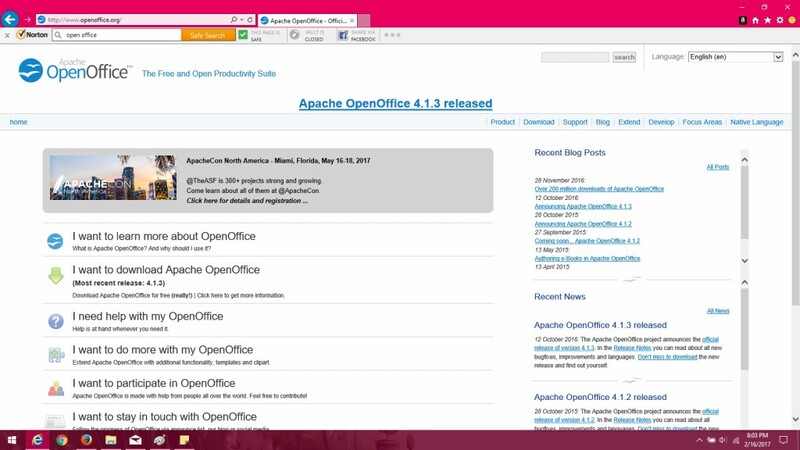 Apache OpenOffice is an open-source downloadable office suite that is compatible with all of the major office software out there (including MS Office). OpenOffice is a terrific option if you need an extensive office suite to work on offline. Like Google's G Suite, Apache OpenOffice files has incredible versatility when it comes to saving your documents in a specific file type. Everything you create within the Apache OpenOffice Suite can be opened by users who use different programs (such as Google or Microsoft Office). 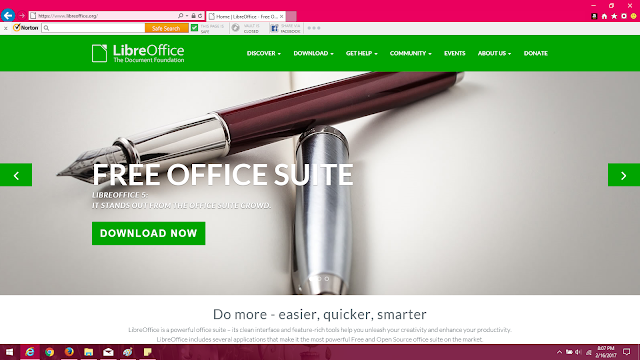 As you can see, LibreOffice rivals all of the other office suites out there. The cool thing that I like about Libre is that you also have a built-in PDF writer. With the three I have outlined for you here, you can see that each one is a terrific Free option. It comes down to preference, needs, and styles of the user. If you choose to go with LibreOffice, then you won't have much need for CutePDF. 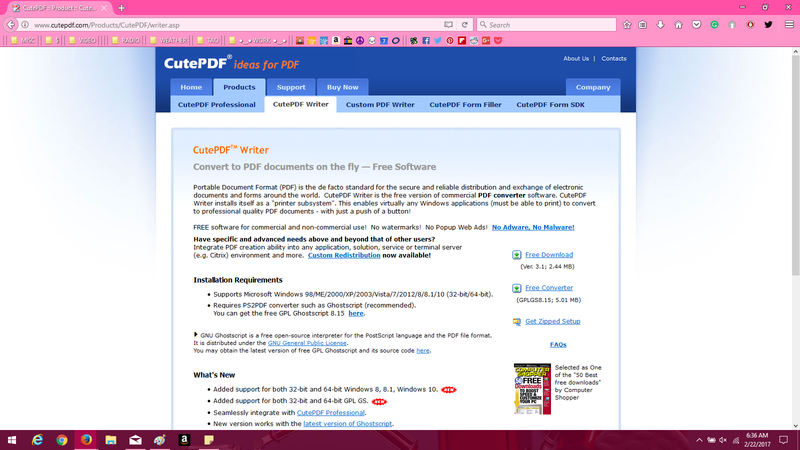 However, if you are using other software, you will find the lightweight CutePDF quite useful. Completely safe and free to download you will be able to convert any document file or image(s) into a professional .pdf document. 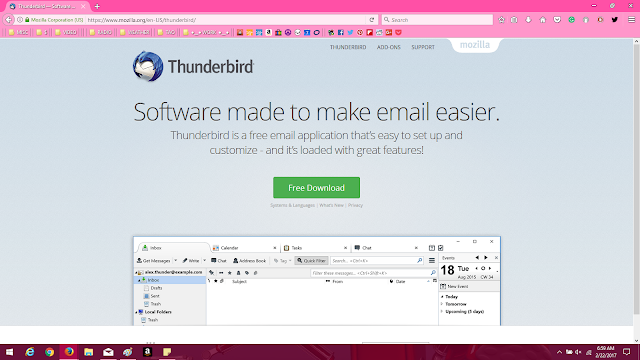 If you prefer to have an email system that you can download your emails too, organize your incoming emails, and easily organize and receive email from various email addresses, Thunderbird is an excellent free choice. You will feel at home with Thunderbird if you are already familiar with the base model and functions of Microsoft Outlook. I love Pixlr. Whenever I need to create an eBook cover or other more in-depth image, I use Pixlr. In the past I have searched far and wide for the absolute best and most like Photoshop program out there that costs zero dollars to use. Thanks to the amazing folks at Pixlr, they beat out any competition to date. Pixlr is an in-browser, online program that you can use freely with or without a user account. I suggest creating a user account as this allows you to save projects that you are currently working on. If you are familiar with Adobe Photoshop, then you will be right at home with Pixlr. 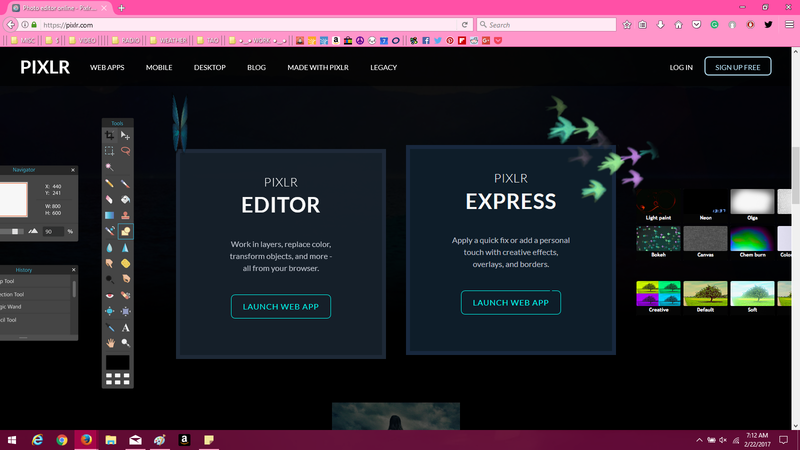 Pixlr mirrors Adobe Photoshops layout, functions, and commands. Make a Kindle Ebook Cover for Free—Without Photoshop Creating an eBook cover is much easier than you think. With the right tools and know-how, you can design a professional looking Kindle eBook cover very quickly, for free. As you can see, there are plenty of Free options for the work-at-home individual, student, or worker on the go. Each program listed here is 100% safe, effective, and just as integrated as the high-dollar big box brands out there. Before you spend your hard earned money on software, be sure to weigh all of the excellent options available to you. I hope you've found this article helpful and wish you the very best on your next project.